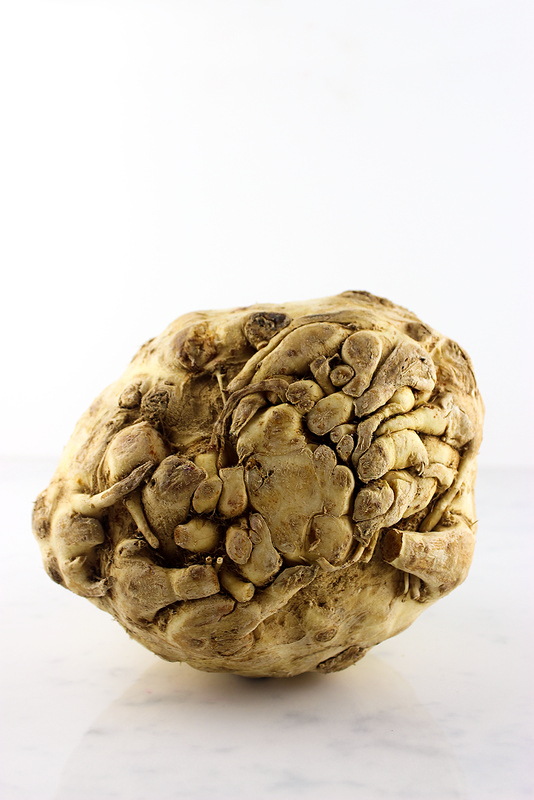 One of the first comments made about this photo was ‘it looks like it should be in a museum’ (the celeriac, not the photo). Given that, the idea of sticking it in the oven and serving it for dinner doesn’t really seem to be the first ideas that comes to mind, nor does eating something from a museum conjure ideas of a delicious meal. 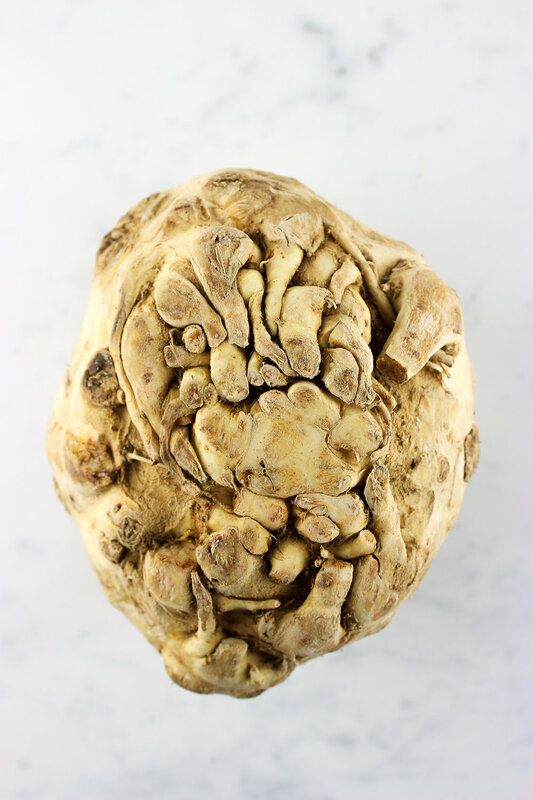 But celeriac is an unsung hero of the vegetable world - ugly, slightly daunting but delicious when prepared properly. Knobbly and odd-shaped, celeriac is a variety of celery, and a root vegetable. It has a subtle celery-like flavour, but with nutty overtones. We like it best in ‘noodle’ form (the answer to all our problems amidst this courgette crisis?) but it’s just as good in mash and soup. Once prepared, it’s rough outer is removed (and about a quarter of it’s size along with it), leaving a smooth veg similar in appearance to swede - much less daunting! - Celeriac noodles are a great meal base - simply spiralise as you would a squash, then serve with your choice of sauce and accompaniments. Think along the lines of a creamy mushroom, thyme and lemon sauce for a comforting winter meal. - Or just simple slice and roast. Sprinkle with salt and pepper, add some springs of thyme and roast as you would any other squash. - Ok, we all love sweet potato chips, so obviously celeriac chips is a must try too. Simply cut into ‘chip sized chunks’, blanche for 5 minutes then cover in olive oil, seasoning and a little polenta, then roast for 30-40 minutes. - Celeriac mash is a great alternative to traditional (and sounds impressive at a dinner party) - simply boil, then mash with coconut cream and seasoning. We like adding a little pear too - add for last 2 minutes of boiling, then mash. - And of course, we can't forget celeriac soup. Roast with onion, garlic and thyme, sauté leeks then add it all to a big pot with a can of coconut milk and stock (veg or chicken). Leave to cook then puree and serve.